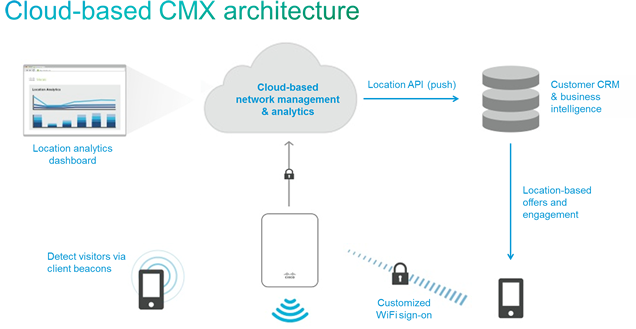 Collect anonymous data about foot traffic or any visitor, optimise your Guest Wifi for Branding amd open up APIs for location based apps through CISCO Meraki's 100% cloud-managed user analytics and engagement tools. Purpose-built for Cisco Enterprise WLANs Optimized for flexibility and control Managed on-premise Cisco Meraki enterprise offers you tools to enable you manage your WLANS using tools installed on-premise. This is useful in enterprise environment involving large transactions. Purpose-built for Cisco Meraki WLANs Optimized for ease of management Cloud managed. The cloud based tools provide convenience if management from anywhere and suitable for all implementations. Provides easy turnkey installation and easy to use management utilities. It is integrated and always up do date with features. Cloud implementations provide easy scalability as the new hardware can be easily provisioned. Cloud implementation can be used from small set ups or sites to large campuses or shopping centres, hospitals etc. Cloud drastically reduces operational costs and capital expenditure. In many cases it is 'on demand' and allows optimised consumption. 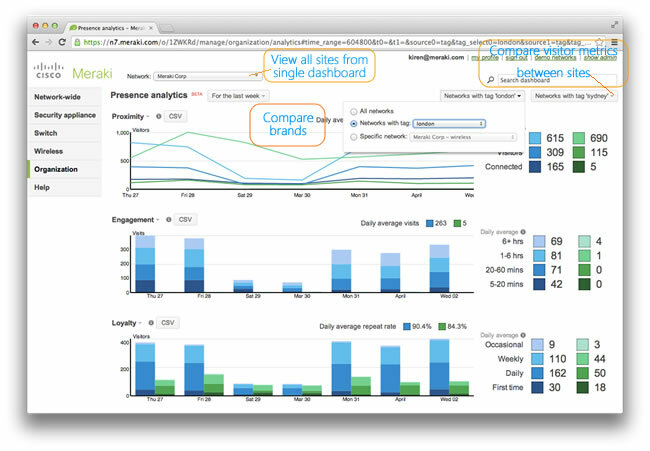 Manage multiple sites, brands, traffic, compare sites using this dashboard.